Did you know that there is a way to clean & store your grapes that will impact on how fast they stay fresh? Real food means lots of fruits and veggies – clean them naturally without chemicals to preserve the goodness A quick and easy way to wash grapes (and other fruits/vegetables)! 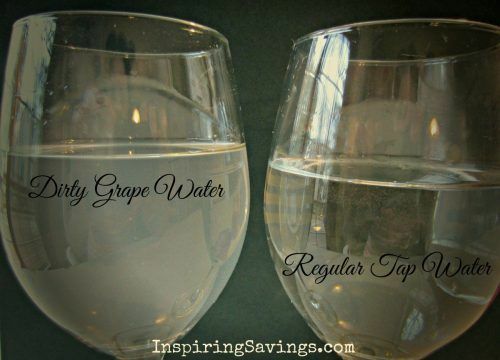 Did you know that there is a way to clean & store your grapes that will have a HUGE impact on how fast they will turn? It absolutely does. 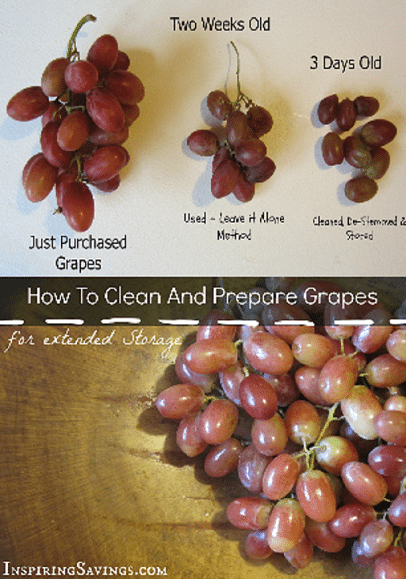 In this post, I will show you How To Clean Grapes. Buying grapes and having to toss them three to four days later is not going to save you any money. In fact, you are just throwing away money and not to mention good healthy wholesome food. The most important step is getting your grapes in the refrigerator immediately upon arriving home from grocery shopping. Grapes will stay freshest when stored at temperatures between 32 and 36 degrees Fahrenheit. If your refrigerator includes a crisper drawer, GREAT! This is where they need to be placed, Otherwise, place them in the back of your fridge where it is always a few degrees cooler. NEXT, don’t even think of cleaning your grapes until you are ready to eat them. That includes leaving them with the stem intact. Washing your grapes and pulling them from the stems will accelerate the ripening process. Rule #1 – Leave them be. I even store them in the bag as is from the grocery store. MAKE SURE, that your grapes in the bag are loosely placed and not tight. The tighter the fit, the less air movement. Bacteria LOVES, cool, dark places without air. Let’s not give them the opportunity to spoil our food. No one wants to eat a dirty grape. BLAH! I have come up with a very simple and effective way to clean grapes. I soak them in a bowl (with stems on) in roughly one gallon of very cold water and add in a 1/4 cup of white distilled vinegar. Not sure how this equation would work for smaller bunches. We eat grapes by the handfuls in our house. I let them soak for 30 to 45 minutes. The best part of this soaking method? There is no need to scrub those grapes individually. The amount of YUCK that is removed from the grapes is amazing. Once they are clean, place on a dry towel and let air dry, then pull them from the stems and enjoy. I would recommend eating them within 72 hours of cleaning them. Again, once clean and de-stemmed they turn rather quickly. 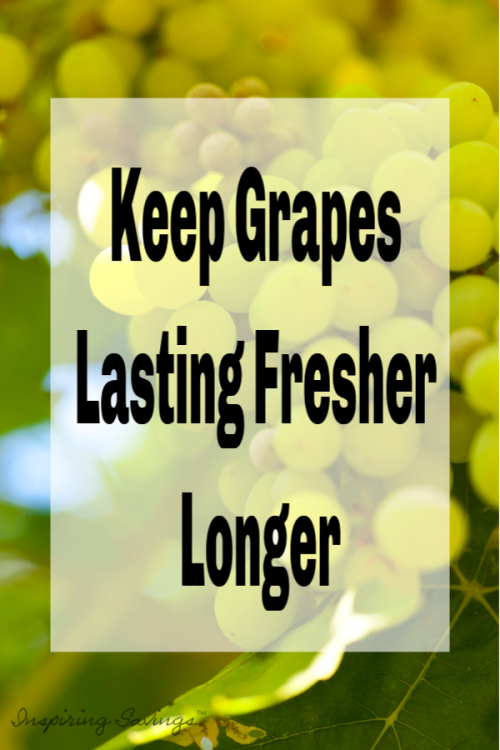 Now it is your turn to enjoy longer lasting fresh grapes!